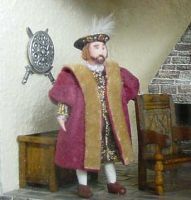 I needed a house for some Tudor furniture I had built, and settled on a small castle. 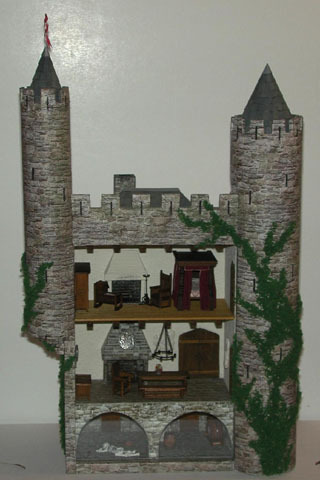 The castle was inspired by various photos, mainly from Chateaux of the Loire Valley by Robert Polidori and Jean-Marie Perouse de Montclos, and all the line drawings in David Macaulay's book Castle (a childhood favorite of mine - I got it for my 8th birthday). 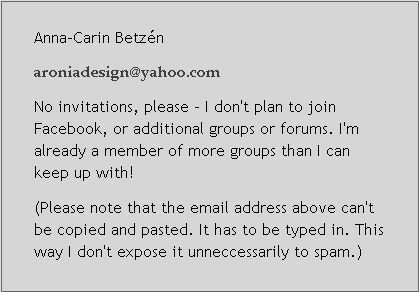 I picked some details here and there, so the design as a whole is probably an eclectic mix of English and French styles from various eras, combined with a good deal of artistic license. My castle is based on a back-opening shadowbox, with additions of cardboard tubes and balsa. The overall design is intended to suggest that this is just a part of a castle, rather than the entire building. For stonework on the exterior and part of the interior I used stone card from the model railroad store. The stone card is index card weight, with a printed and embossed stone pattern. It came in postcard-sized sheets, and I hid the joins as best I could. When I had covered all of the castle, I thought the colors of the stone were too bright so I made a "dirty wash" from water and black and brown acrylic paint and applied it with a cotton ball. When the wash was dry, I added the ivy. 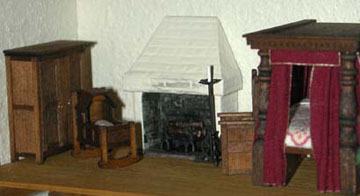 My instructions for a fireplace similar to the ones in this castle were printed in LEN, volume 5, issue 6. I covered it with embossed card like the exterior. 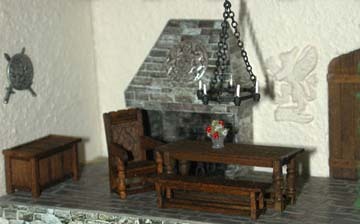 You can also find instructions for the firedogs, chest, chandelier, and upstairs candle stand in that issue of LEN. The shield on the fire hood (a button with the shank cut off) has a motto on it - it says "Dieu et mon droit" (French for "God and my right"). This motto was used by King Richard I in 1198 and adopted as the royal motto of England in the time of Henry VI. The chair, table and bench are based on 1:12 designs from old issues of the magazines The Home Miniaturist and Puppenhäuser und Miniaturen (a magazine in German). The door at the right is presumed to lead to the stairs tower. I gave the walls a few coats of paint mixed with sand, for a coarse stucco surface, but I didn't paint the door areas. This made the doors sink in so they're more or less level with the surface of the walls. A swaddled baby is sleeping in the cradle. 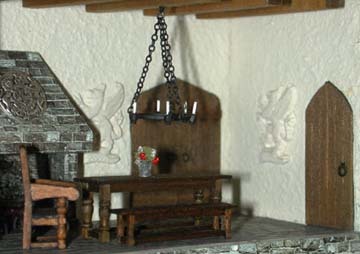 The clothes press and box chair are based on photos of 1:12 scale furniture, while the cradle is built from 1:12 scale plans by David Weller in Dolls House World . The embossed card on the fireplace shows through the paint as stone shapes on the hood. 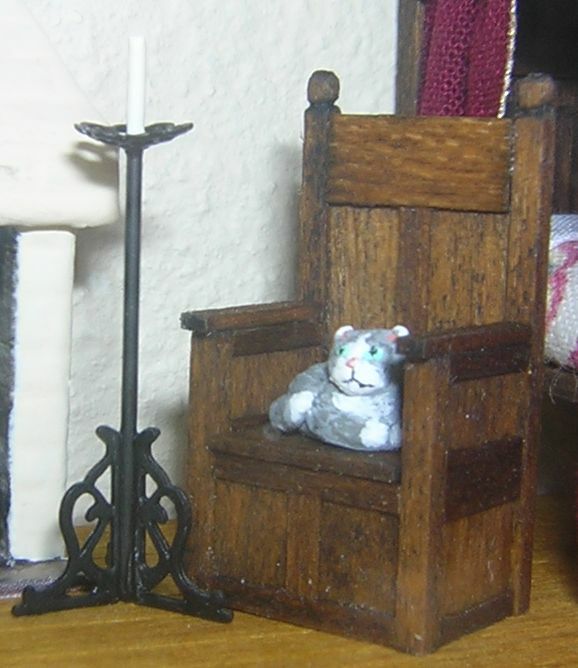 A cat by Pam Scott has made herself comfortable in the box chair by the fireplace. The great bed, which is part of the reason why I wanted a really grand building, is my 1:48 scale version of a bed in The Home Miniaturist. The turned posts are commercial turnings that I cut to length. I cut some cross hatches on the big bulges in an attempt to add more detail. 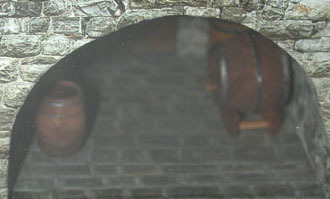 Food cellar with barrel of wine and other supplies. The glass front reflects some light, giving a misty look at this angle. As the cellar and dungeon has a comparatively low ceiling height, I could make the other rooms more grand. Is he a poor prisoner, who died in chains? No, this is a thief who broke in intending to steal the family's treasures. He went prying about in the cellar but had a bit too much of the wine he found, and trying to find his way back upstairs he mistakenly took a wrong turn and ended up in the dungeon where he passed out and died on the spot. 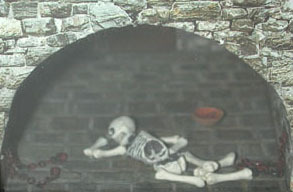 No one knew he was there, so his skeleton remained forever and a day in the dungeon. The lord of the castle is about to take a seat in his chair. His wife thinks she heard their son cry, so she's heading upstairs to take care of him. Another photo of the couple is found on the dolls page. 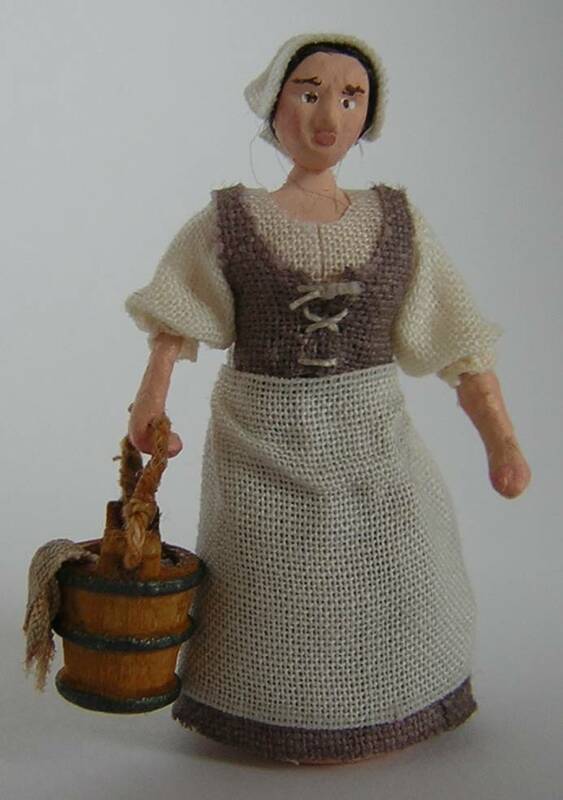 They're not alone in the castle; they have a hard-working maid, here seen carrying a bucket of water to scrub the floors. I presume there are other servants too - maybe they just didn't happen to be around to have their photo taken.